Combine inspiration from my little debacle with the Prince of Wales’ photomontage, a boring Saturday, and this is what you get. Staring at the viewer and a hint of a smile make a huge difference. Click for larger image. Original front and back. 1870s-80s CDV. Private Collection. Photographer: Carl Anderson (a British expat photographer?). Wenden. Russia. 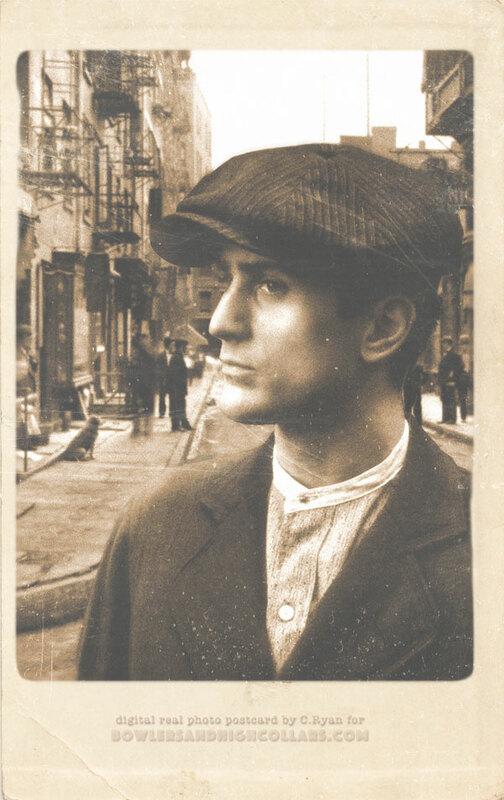 Robert de Niro as Vito Corleone digital real photo postcard by C.Ryan. No, really. ;) Ok, so this isn’t really a vintage picture, but I was bored tonight and decided to play with Photoshop. Even though I only started collecting vintage pictures this year, I’m influenced by and always loved period films and books. And of course, Vito Corleone is one of my favorite characters! I had to do a real photo postcard of him, as portrayed by Robert de Niro. The background is a detail of a photograph taken of Pell Street, in the Chinatown of New York’s Lower East Side in the 1910s. Digital portrait by Caroline C. Ryan. A new feature of this site to go along all the pictures I collect. The other day I found a large lot of CDVs. As I flipped through them an idea came over me. What if I made unique, composite portraits out of those people? Take their best features, tweak them and create someone completely new. It sounded like it would be a fun little project. This gentleman is the composite of two CDVs; one of a boy and the other of an adult as seen below, along with some tweaking and photoshop painting. The idea is to make my new vintage gent look as real as possible. Scary, hm?